They're are being poached and captured for their fur and medicinal uses. Most new born tigers will not live to adulthood, because their mothers have been poached or taken away from the wild. 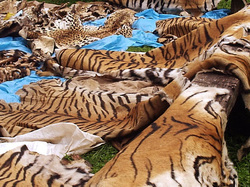 Laws have been put in place to protect tigers and their environment. But this is hard because Siberian tigers live across several different countries. Some more caring than others... "cough" Like "cough" China, and India, (See left picture of a couple dozen poacher tiger coats) On a more positive note Amur tigers have reached a constant and steady 500 adults in the wild. The only reason Amur tigers are still around today because they can tolerate and survive in a environment much colder than what humans enjoy. Some what, they have hidden in the far most ends and corners of the earth. To escape mankind and to escape extinction. In the early 1900's Siberian tiger were not just isolated to Siberia but all of Southern Asia. Over the past hundred years Siberian tigers have been dying out, and are now in high risk of going away forever they play a huge role in a very exclusive environment. We need to protect Siberian tigers.